Touring around The Big IslandBack in Kona we were eagerly anticipating the tour that Hector had been planning over the past 7 years awaiting our visit. We had been hearing about Ken Love and were greatly looking forward to meeting him. 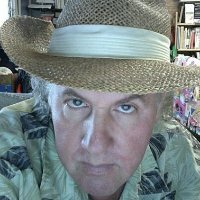 Ken Love is a larger than life person and it would take a book to do him justice. In a macadamia nut shell, he travels around the world researching and giving lectures. Love wears many hats. 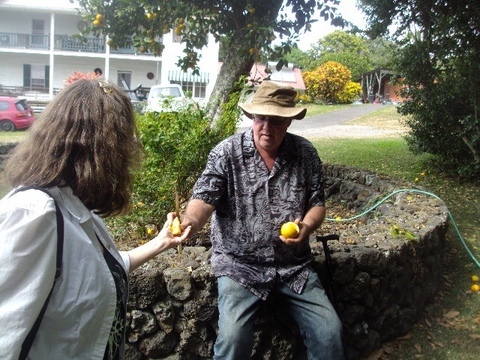 He is president of Love Family Farms on the Big Island and has been growing pineapple, and numerous other tropical fruit for nearly 30 years. 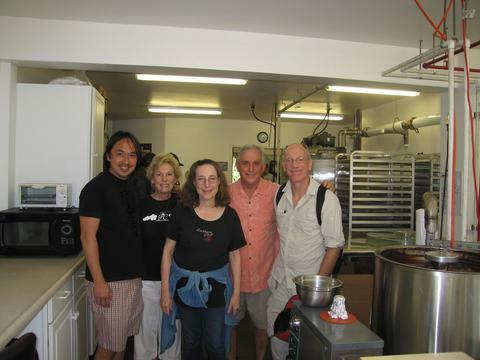 He is vice president of the Kona Kohala Chefs Association ACF. 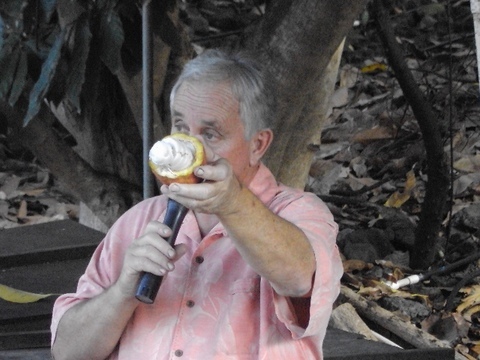 As president of the Hawaii Tropical Fruit Growers he is instrumental in the development of prototype sustainable agriculture systems for farmers in Hawaii. He assists growers with market development for unusual tropical fruit by establishing farmer chef relations and agtourism options. Most recently Love has recently performed a feasibility study on marketing Kona coffee in South India and is currently assisting with avocado market research and managing fig variety trials. He has just completed filming a documentary with Bill Pullman, called "The Fruit Hunter." So you can imagine how at lunch with him at the Nasturtium Café, over bison burger, chicken with mango chutney, and fish quesadillas, we were all spellbound by his contributions and accomplishments. After lunch Ken invited us for a tour of his amazing farm. In the front yard we got to taste an orange from a tree that is the oldest orange tree in the United States, planted in 1792 by botanist Archibold Menzies. We followed Ken through the gardens tasting all manor of exotic tropical fruits including mangosteens, noni (a South American cure-all fruit), dragon fruit, white fruit with black seeds, huge ugli fruit, Tahitian gooseberries, bilimbi (used for salad oils and pestos), guava, bread fruit (sought after in the story of Mutiny on the Bounty), and rambutan. 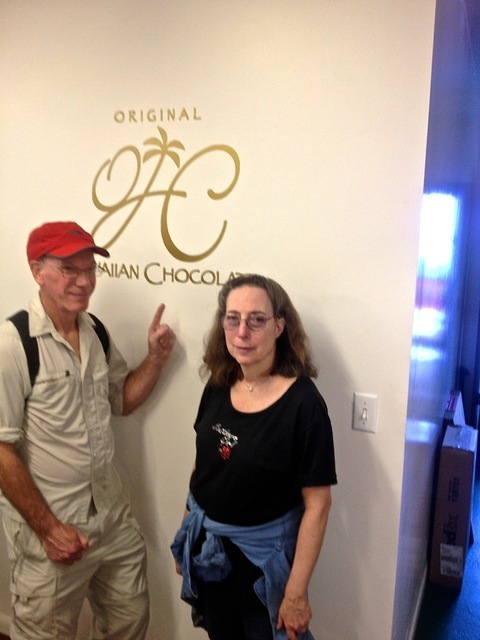 Next on the tour was a fascinating visit to the Original Hawaiian Chocolate Plantation and Factory. Unbelievable as it may be given all the chocolate from around the world that I have tasted, I had never seen it growing before. 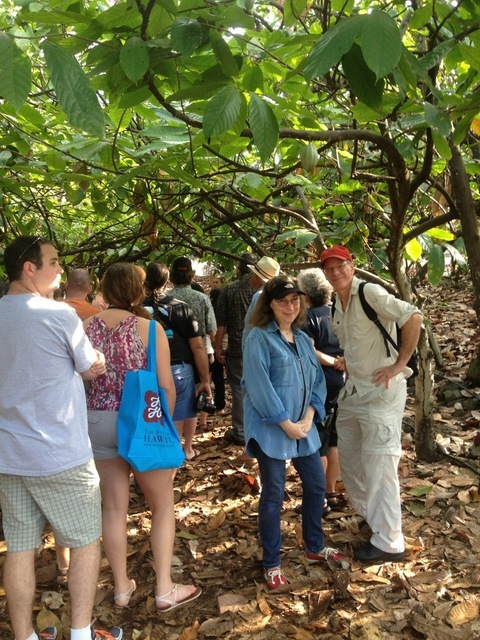 We had the opportunity to see the cacoa pods growing on trees, a pod cut open, and to taste the chocolate. All of the chocolates are pure single origin with no blending. My favorite was the Criollo for its smooth round flavor. Owner Bob Cooper gave an informative lecture on chocolate production with such enthusiasm it seemed he was doing it for the first time! Day two of our tour we were on the road at 6:30 am to circle around the island, stopping at many interesting sites. 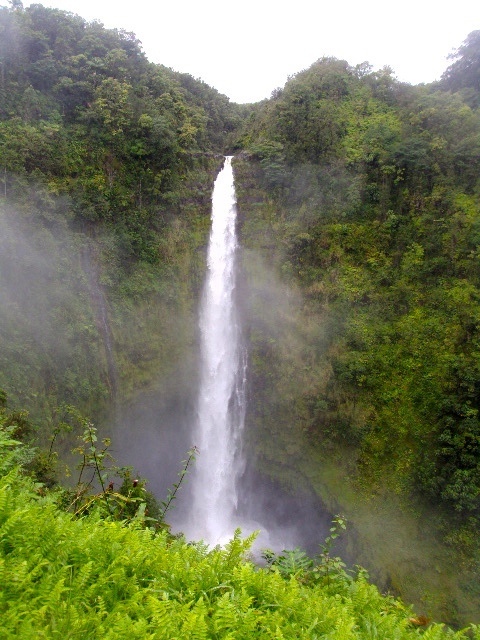 The Hilo side of the island has an entirely different environment from the Kona side as it is on the side of the mountains that receives most of the rain. As it was a day long drive, it gave Hector the opportunity to practice his talent as a talk show host, interviewing me and wanting details of the roots of the Cake Bible and my entire past that led up it to it. 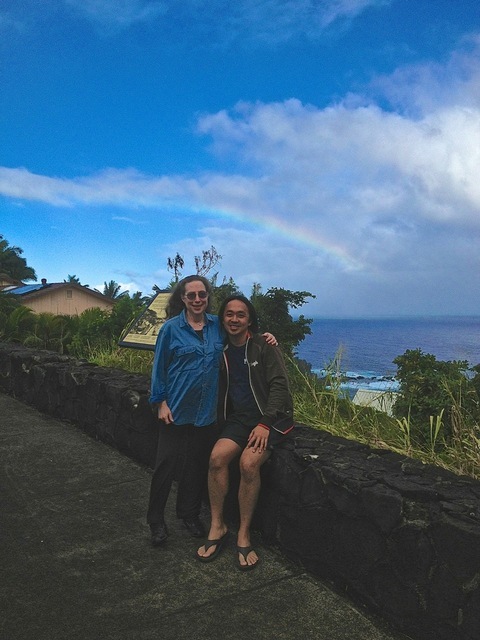 We stopped by the side of the road to enjoy the rainbow and then it was on to the famous Akaka falls with their 492 foot drop and walk through the rain forest. 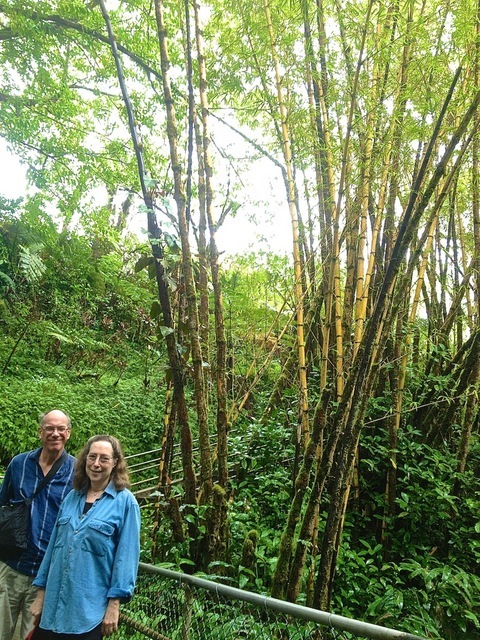 On the way to the Kilauea Volcano we stopped at the Akatsuka orchid green house where I saw more orchids than I had ever seen before in my life. 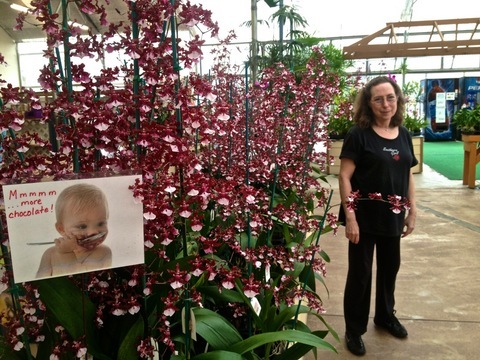 I always thought orchids had no smell but was proven wrong. One orchid even smelled like chocolate. We had lunch at a lovely rustic Inn, the Kilauea Lodge Restaurant, near the volcano where we all shared a delicious passion fruit margarita, and ate less delicious crab cakes and bison burgers. 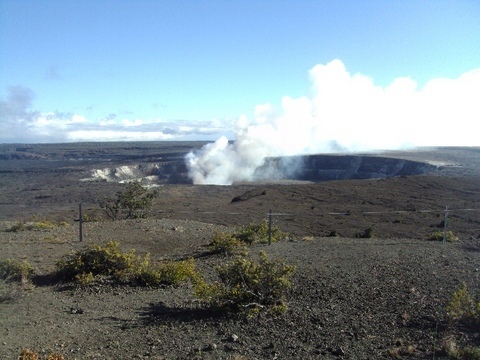 The Kilauea Volcano is still active so the volcano's open crater interior varies in height virtually every day. We saw maps indicating the new island that is growing under the sea to the south of Hawaii. 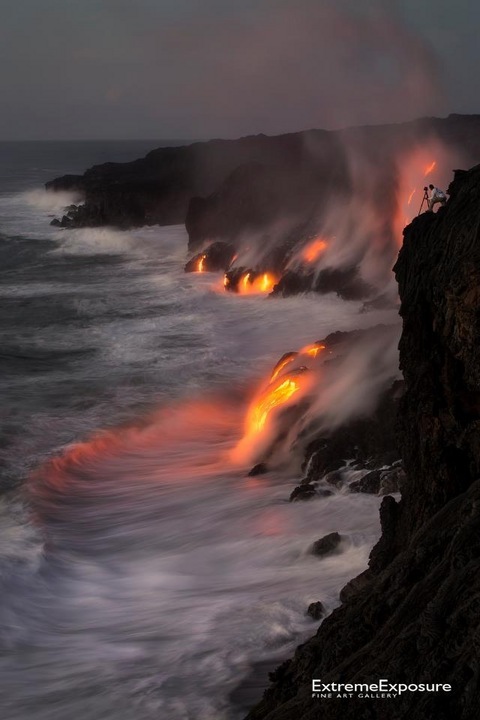 Hector send us this amazing photo of Kapalana lava flowing into the ocean, taken by Bruce Omori at dawn on New Year's day of this year. 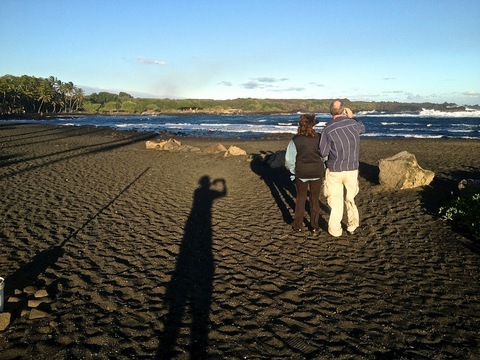 As we drove back to Kona, we stopped for a short but dramatic visit to the black sand beach, created from pulverized lava rock. If you look closely you will see the high wind that is blowing everything including us and the surf. Next day was the much-anticipated highlight: private astronomer guided visit to the Keck Telescopes on Mauna Kea, the world highest mountain when measured from the bottom of the ocean.